Fabulous flat in stunning village. Perfect for couples, families and friends. 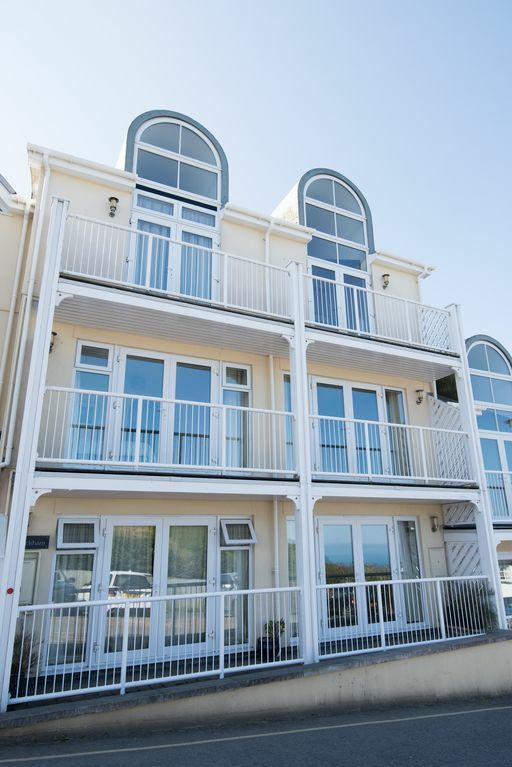 6 Bluestone Point is a first floor purpose built flat (with lift) in the gorgeous north Devon village of Mortehoe. There is one allocated parking space with further parking available in the village. The master bedroom has a king size bed with ensuite wet room, access to the balcony and a sea view. The second bedroom has twin beds and use of the family bathroom. The open plan lounge, kitchen, diner also has access to the balcony, the perfect spot to watch the sunset. The kitchen is well equipped with a gas oven, 5 ring hob, dishwasher, fridge-freezer and washer-drier. The breakfast bar seats four, as does the dining table. The lounge is the perfect place to relax, watch the sunset, a film, play a board game or read a book. Bluestone Point is 50 metres from the coastal path with access to seal spotting off Morte Point, views to Lundy Island and across to Pembrokeshire. North Morte Road leads out to Bull Point lighthouse and onwards to Lee Bay and beyond. Rockham Bay is the nearest beach, accessed by foot and a great spot at low tide. The famous Woolacombe Bay, with two miles of soft sand and fabulous surf is a mile down the hill. Mortehoe is served by a well stocked and friendly village store, open most of the year. There are two great village pubs both serving home cooked food. The post office / newsagent has local maps and souvenirs as well as the normal papers and magazines. There is also a fish & chip shop in the village square, a national trust tea room and take away serving home cooked meals and puddings. The village museum is a wealth of local history. Nearby Woolacombe has a range of shops, cafes, hotels and surf schools. The tourist information office is a great place for answering all your queries. There is the option to bus or taxi back up the hill for tired legs! Ilfracombe is 5 miles away, with a working harbour, Damien Hurst’s Verity, art galleries, cafes, bars and restaurants. Here you’ll find the nearest supermarkets (Tesco and Lidl), butchers, greengrocers, bakers and chemists. There is a three screen cinema on the high street and the Landmark Theatre which offers a variety of shows throughout the year. The public swimming pool offers sensational sea views. Barnstaple is a market town on the Tarka trail, with various options for flat cycling along the estuary. A large leisure centre, cinema and theatre and the nearest train station. We are Katie & Gareth, we have been visiting Mortehoe all our lives. We now live nearby and are pleased to be able to share our flat with others exploring the area for the first or hundredth time! Bluestone Point is the perfect location for walking, sitting, exploring or surfing. The modern flat has everything you need for a comfortable home away from home. Please don't hesitate to ask any questions. We will do our very best to accommodate your request for dates and stay durations. Location, location, location! Perfect spot for sunsets, easy flat access to the village and fabulous walking from the door. 6-10 Meg download. If you have WiFi calling on your phone activate it as you will get very little signal. Bath sheet, hand towels, bath mat and beach towels provided. Dog towels provided too! Also OS maps of the areas with walks from the front door. Tide book too for the surfers! A selection of board games, playing cards and some jigsaws. Accessible from the bedroom and the lounge. Good access for a wheelchair user. Dropped kerbs from the car park to the front door. Wide hallway to the lift that arrives on the landing outside the front door of the property. Property is well spaced to allow easy access to all areas. Wet room shower panel folds flat to give full 'wet room' access to the facilities.